With colour being used more and more as a tool within lighting designs and with the additional desire to scroll through colours slowly or quickly, the demand for suitable drivers for cold cathode was created. COLOURTRAN blends our knowledge of control gear for Neon and Argon lighting with our experience in theatrical controls to create a three channel convertor controlled by DMX for the smooth dimming of Red, Green and Blue (RGB) tubes to create an almost endless palette of colours (16.77 million to be precise). • Three convertors in a single enclosure. • Dimmable to 1% with DMX512 digital input. • Silent throughout the dimming range. • Ideal for colour mixing applications. • Optional infra-red remote control package available. • Constant current High Frequency output. • No minimum length of tubing. • Open circuit, short circuit and overload protected. • Complies with EC EMC and Low Voltage Directives (CE). • EN 61050 and EN 50107/EN 61347-2-10 (Draft). • Fitted cable glands (ten). • Mode products are guaranteed for two years. Available in three different voltage ratings, which dictate the tube lengths that can be controlled, each unit has a different output current rating which determines the maximum brightness of the tubes. 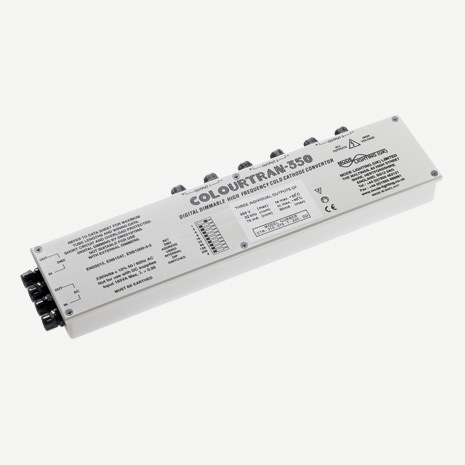 Each COLOURTRAN can be addressed to any DMX address from 001 to 510 allowing for great flexibility when used in conjunction with DMX Control Systems. COLOURTRAN can be used for more than just RGB installations. It is a three channel Neon/Argon convertor and therefore can be used for any three channel application from simple control to dawn-dusk simulation using orange, white and blue tubes, or daylight replication using three white tubes of different colour temperatures. Phase locked outputs allow very smooth dimming of the three channels which operate at high frequency to prevent “camera flicker” seen with some cold cathode and LED products when used on film and TV sets. For single tube applications the DIGITRAN is a single output version of the popular COLOURTRAN and has been widely used in stage and TV set signage and light artworks. For simple control there is an infrared receiver system which allows a handset to select any one of seven preset colours, or run a colour cycle. For retail displays patterns can be set using the DMX Replay Unit which can be programmed to run in a “stand alone” mode. More advanced patterns which can be triggered manually or by timeclock control can be generated automatically using the ColourStyle Control Plate.